This morning we had a later start and went to the Chauchilla Cemetery. 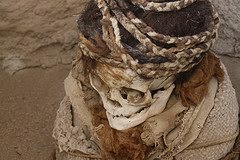 It was quite fascinating but, sadly was only found because the grave robbers got there first so the mummies weren't in as good a condition as I can only imagine they would've been - mostly they were just bones after being discarded in the desert heat. But it was still pretty damn awesome to see! All the mummies are in foetal positions and have been wrapped (which is how they were buried). 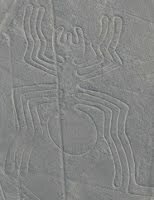 Most of them are in what they assume are family groups and there are plenty of very young mummies too! Is amazing to see how well conserved their hair is too! And they had *very* long hair!! It is also kinda surreal to me that it is all still out there wide-open (as opposed to having been relocated to a museum or something). There are large open grave excavations in the dry earth, with nothing more than a shade cover above them. 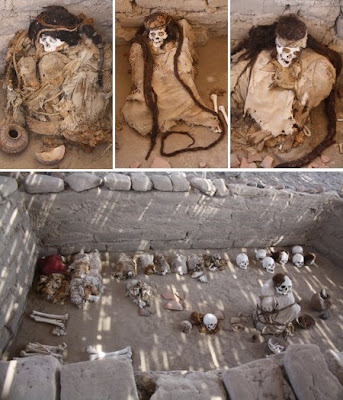 Plus there were two more mummies that were in a museum room which were saw after walking thru the actual cemetery that were undiscovered by the robbers and in original condition. We also got to stop at a more recent cemetery on the way back to town ... I dunno why, but I think graveyards are just gorgeous for photographs :) And it's fascinating how people remember their dead. Although I'm all for cremation, I'll admit the idea of a gravestone or something really does appeal to me. After that they took us to a few other places to show us how the Nazca made pottery and then to see a demonstration of the gold mining process. Nothing too spectacular, honestly. (Clearly my preference is for dead people - haha). 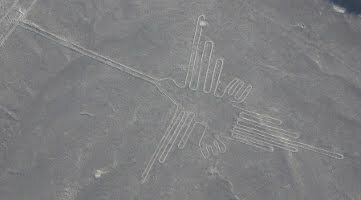 After lunch we went for our flight over the Nazca Lines. *YAY*. Well, it's quite a strange experience. We went up in a tiny 4-seater place so that we all had window seats (in groups of 4, obviously). And honestly, even tho I'd taken an air-sick tablet beforehand, I felt I couldn't really appreciate the experience until I'd landed and was looking thru my photos because I felt positively ill for the entire flight. Which I suspect was mostly due to flying in circles at a right-angle to the earth (see photo on right - makes me ill just looking at it! ), twice for each Nazca Line, to ensure each side had a chance to get some photos. Nausea aside tho, I am not sure how I feel about the whole experience. I am no closer to understanding what they are all about that I was before the flight (did I think I would be?!? ), and really, they are not glaringly obvious as you might expect from photographs. There are so many lines all over the earth (something to do with the type of earth & the lack of wind(?) there, apparently there are still car-tread marks made in the 1920s), but when you see one of the figures, they are clearly not accidental. I'm not sure how they know when they were made tho. And I do wish we'd had a chance to actually go and see one of them from the land, up close ... even if we couldn't have seen the figure from that view-point, just to get a better idea of what they look like in real life and not from the air (does that make any sense?). Still, they're fascinating. And that was us for the day until we caught our 21h30 bus to Arequipa. @UselessRob & I hung out at the hotel pool chatting the time away. So far our group is fab and based on the dynamic so far, I really think the smaller groups work better. I'm also fascinated how the more I travel, the more places remind me of other places. Peru so far definitely has aspects of Namibia and Egypt. Wow, that looks amazing. The one looks like a giant ant to me (I prefer ants to spiders thanks) and you weren't kidding when you said their hair was long! I would love to see the lines, but like you I would also like to go up close to them and see what they look like on the ground- if anything. I love the archaeological aspect of visiting countries like that!